This year, January has been such a variable month. On Monday, when I went to a library meeting, I was dazzled by the night sky. It was just past dusk, shading into night with a sapphire blue horizon. Into that beautiful blue came the rising moon, a glimmering sliver, a slice of brilliance. On Tuesday, knowing that a snowstorm was coming, Clif and I (and Liam!) took to the woods, where the ground was nearly bare. There were patches of ice on the trail, which meant we still had to walk carefully. To borrow from Paul Simon, the sky was a hazy shade of winter. When we got to the brook, we found that ice had been thrown this way and that, just perfect for taking photographs, some of which were featured in this week’s Wordless Wednesday. While I was taking pictures by the brook, I heard a mighty crash. “What’s that?” I asked, whirling around. “Liam fell through the ice, but he’s all right,” Clif answered. Already on the shore, Liam was shaking his back legs. This confirmed one of my worries about Liam and winter ice—his basic unawareness of thin ice. When we have walked by the Narrows, where the water is deep, I have watched him carefully, only letting him on the ice when it was completely frozen. With the brook, there are no worries. The water is shallow, and the current is gentle. Still, this was a reminder that my concern is genuine. We came home and had fresh homemade bread and leftover red bean soup. While we ate, it snowed outside, and before I went to bed, I turned on the porch light. “A nice little snowstorm,” I thought, seeing several inches on the porch. 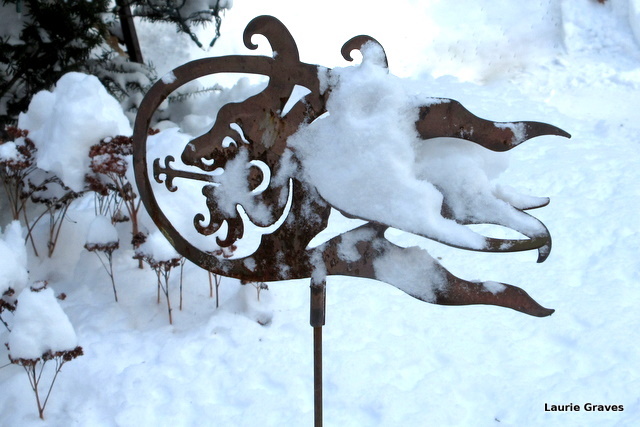 On Wednesday, we woke up to find that about six inches of perfect, light, fluffy snow had fallen. 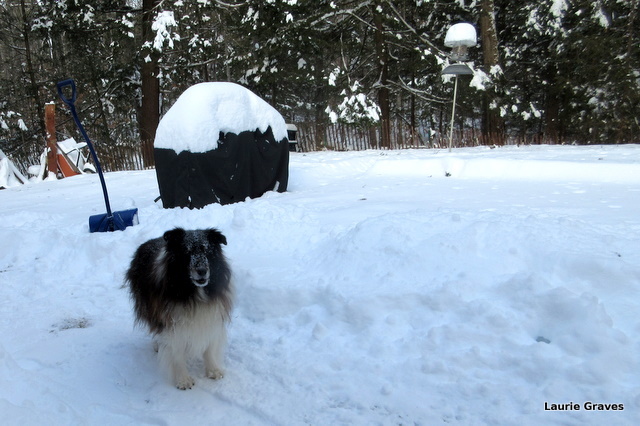 This, of course, meant clean-up, with Clif on Little Green, me with the shovel, and Liam to leap, bark, and supervise. Somehow, January is never long for me. I don’t mind the cold, and I don’t mind the snow, as long as it’s not heavy, and we don’t get more than a foot with any one storm. I suppose it’s because I was born in central Maine, and I have lived here for most of my fifty-eight years. To me, snow and cold are a normal part of life. Then there is the beautiful winter light, which my small camera cannot always capture. Brilliant during the day, deep and mysterious at nightfall, this light makes January a month to look forward to. Liam was just fine. He is built for cold weather. Love the way you judge storms. We do a similar thing here at the little house in the big woods. That’s a good one! “It’s up to the benches” or “It’s reached the top” or “By God, it’s crested the table.” Too funny! Great post, Laurie. Poor Liam; I hope he’ll learn – how old is he? 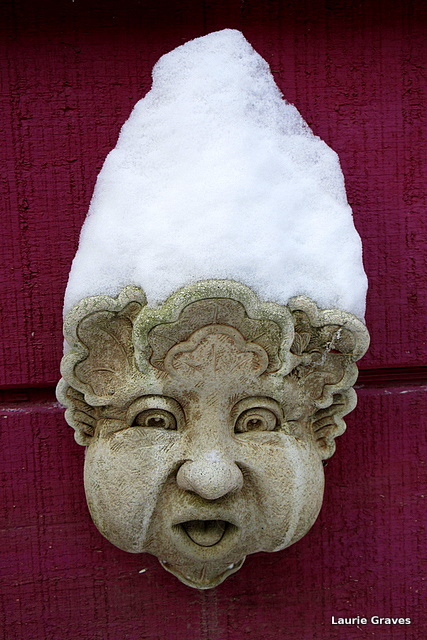 Love the snow capped gargoyle. Every thing looks so clean in the snow. Liam is 11 today! Happy birthday, Buddy! I hope he’ll learn, but we won’t be taking any chances. If we are near deep water and thin ice, we will keep close tabs on him. Yes, newly fallen snow gives everything a clean look. Do keep off the thin ice. Happy Birthday to Liam! Thanks, Mary! And Liam thanks you, too. Very fetching snow cap on Gideon. 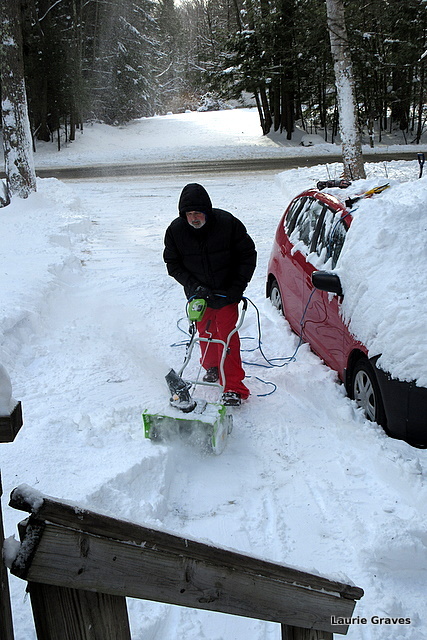 If I lived where you are I too would probably invest in a snowblower. Jason, for years we shoveled it all by hand, but as we advance in age, we find that we need a little help with what can be a daunting task. Thanks, Derrick! And the light of winter can’t be beat. At least in Maine. We are having a lovely snow storm today. Soon, I’ll be going out to shovel with my buddy Liam.